Home / Articles / In the race between Turkey and the UAE, Somalia wins. The base in Somalia will be Turkey’s second overseas installation, but it will be focused more on assisting Somalia than demonstrating Turkish military capabilities. As Turkey expands its geopolitical and economic presence in the Middle East and East Africa, the projection of power through the military will be a key part of this growth. The development of overseas military capabilities will lead Turkey into competition with other countries, such as the United Arab Emirates, that have embarked on a similar path. With a new military camp in Somalia, Turkey is strengthening its ties to the East African country while extending its reach as a regional power. Turkish forces are expected to get to the installation, which has been under construction for about two years, sometime this month. Their arrival comes soon after the deployment of Turkish forces to a larger base in Qatar. 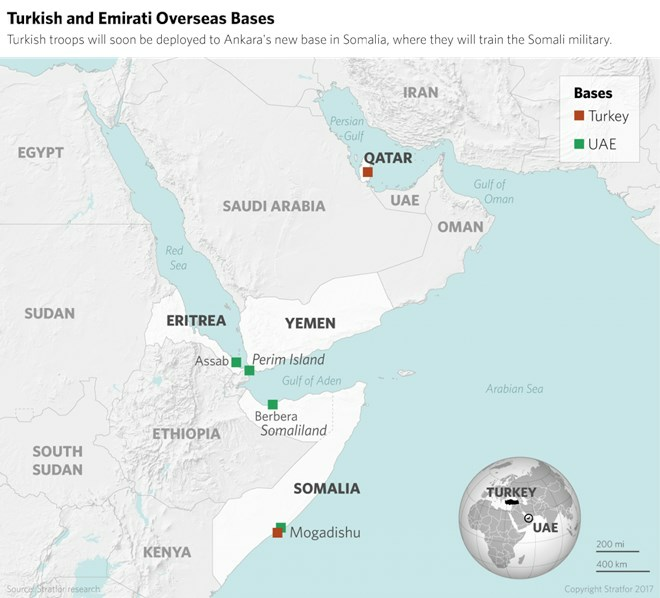 While Ankara has been operating military facilities in northern Iraq, the Qatari and Somali bases are the first of its military installations hosted by allied states. And as Turkey pursues its interests throughout the region, it no doubt will run into like-minded countries, such as the United Arab Emirates. Unlike the base in Qatar, the facility in Mogadishu will be primarily occupied with military training, and the training of Somali soldiers, in particular. Current plans do not include the deployment of a Turkish contingent capable of conducting military operations. Instead, about 200 Turkish soldiers will train up to 10,000 Somali National Army troops. But the long-standing relationship between Ankara and Mogadishu is not based solely on the benevolent actions of Turkey. Turkish aid organizations, a Turkish hospital in Mogadishu and educational opportunities for Somali civilians have given Turkey a prominent position in Mogadishu. But the Turkey-Somalia relationship is closely tied to the economic interests of Turkish corporations that seek to develop and manage infrastructure in Somalia. For example, the Turkish company Albayrak manages the Mogadishu seaport, and Turkish companies have made bids to do the same in the southern port city of Kismayo. However, Turkey is not the only country looking to build this kind of relationship with Somalia; the United Arab Emirates has been pursuing the same contracts. Both Turkey and the United Arab Emirates are aware that Somalia sits on some of the world’s major shipping lanes, and they see opportunities to build seaports and other transport infrastructure. These factors, as well as the Somali government’s need for outside help, make it a logical target for development by the United Arab Emirates as well. For example, Emirati company SKA Air & Logistics runs the Mogadishu airport, and UAE companies have competed for the development of the port and airport in Kismayo. In fact, the United Arab Emirates preceded Turkey in Somalia and has been operating a military training facility in Mogadishu since 2015. The UAE-taught Somali forces are considered some of the most reliable and well-trained in the regular Somali National Army, which is why they were put in charge of security for the city of Mogadishu several months ago. Of course, the competition between Turkey and the United Arab Emirates isn’t limited to Somalia. The deployment of about 250 Turkish troops and 30 armored vehicles and artillery pieces to Qatar plays into the regional crisis involving the Gulf Cooperation Council (GCC). Turkey, which competes for a dominant position in the region with these Gulf states, has supported Qatar not only with its military deployment, but also through economic support during the trade embargo implemented by some GCC members. The Turkish deployment in Qatar is still in an early stage, but some Turkish officials have suggested it could reach up to 3,000 troops and include fighter aircraft and naval vessels. If it does, Turkey would have a noteworthy combat capability in the Persian Gulf. On the other side of Saudi Arabia, the United Arab Emirates has begun building several permanent military bases near the Bab el-Mandeb strait during the past year. The conflict in Yemen has been a significant driver of these efforts, though the quantity and permanent nature of the bases suggest that the United Arab Emirates is more focused on its long-term geopolitical position than a short-term military operation. The United Arab Emirates, moreover, already operates a base in Eritrea that serves as a logistical hub for ground forces in Yemen, though the installation also hosts aircraft and will soon have a dock for naval vessels. The United Arab Emirates has been observed building similar facilities at Perim Island in the Bab el-Mandeb strait itself, and there are plans for a base in Berbera, Somaliland. Combined, these positions will give the United Arab Emirates three full-fledged military bases at or near the Bab el-Mandeb strait while providing access to the Red Sea and the Gulf of Aden. The UAE training center in Mogadishu will complement these positions, even if it doesn’t have the same military capabilities. As Turkey and the United Arab Emirates develop their military and economic ties throughout the Middle East and East Africa, their military and economic competition is likely to intensify. In the short term, however, the Turkish presence in Mogadishu will give a much-needed boost to the stability of Somalia and the security forces that the United Arab Emirates has helped to build.